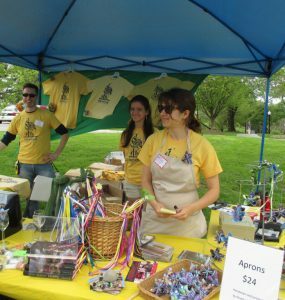 Volunteers are a vital part of the Revels family and volunteering is a great, fun way to become part of the Revels circle. There are a variety of ways to get involved, so you can match your age, experience, and availability to what suits you. Volunteers are also eligible to sing with our May Revels chorus in the spring! Fill out the Washington Revels Volunteer Interest Form [Word Doc] and email it to the Volunteer Manager at volunteer@revelsdc.org. Front of House – Lend your talents to tasks that support overall Revels efforts and draw folks to performances: event planning and preparation, marketing and publicity, office administration, fundraising, and public relations as a Revels Representative. There are opportunities year-round! Behind-the-Scenes Production – During the fall, get crafty at Wednesday Night Work Parties. Or during the Christmas Revels production, help make the on-stage magic happen by joining crews for props, wardrobe, stitchers, makeup, hair, and backstage. Even more – … Haven’t found anything that strikes your fancy yet? (Really?) Washington Revels is always looking for photographers, videographers, drivers, loaders, event help, and more. Let us know that you want to volunteer and have no worry, we will find a place for your efforts! Love to shop? Well so does our audience! Help us sell books, CDs, T-shirts, ornaments, and other glorious Revels merchandise before and after the show and during intermission. It’s a great way to connect directly with our audience members — you are the first to hear all the compliments! Sellers should be adults or high school-age teens. A two-show minimum commitment is required and we ask that you attend one training session before your first shift. Additionally, we ask you to arrive at least one hour before show time to help set up and to familiarize yourself with the merchandise. During the performance you will be able to watch the show for free. Be the first to welcome our audience members into Lisner Auditorium! We need volunteers to direct people to the correct ticket lines, pass out Will-Call tickets, and possibly to assist with ticket sales (not actually selling tickets). A two-show minimum commitment is required and you would be needed in the front lobby starting one hour prior to the performance until the Box Office closes. Then you can go in and watch the show. Are you the life of the party? Do you love to organize and get all the details down just so? If so, Washington Revels needs your help on our special events. From cast parties to Galas, from working with the venues to setting up the food, from making sure everything looks just right to much, much more — we need your special touch. Love to spread the word? Then help us promote all of our incredible productions, big and small, as well as our educational and special programs. We need volunteers to take photos and videos, prepare promotional materials, deliver flyers, hang up posters, call potential program advertisers, and even post event info on various community and school listservs. Some events are ticketed and some are free — but every one of them needs your help to make sure the community knows what’s happening and when, along with what they might be missing if they don’t attend. Are you good with green, or love to network? Ticket sales alone don’t cover our costs, so Washington Revels relies on the support of companies, foundations, and individuals like you. 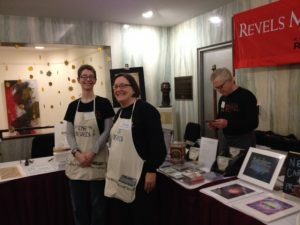 Whether it’s researching grant opportunities, writing a sponsorship pitch, soliciting auction donations, or thanking donors, all of it helps to grow the Revels circle ever wider. Every dollar you raise for Washington Revels goes directly into putting on the events, programs and educational services that that you love and that make us such a unique performing arts community for participants in the DC/MD/VA area. The smell of the greasepaint … This crew helps the teen and adult chorus, and sometimes the principal actors and musicians, put on their stage makeup before each show and check for needed touch-ups during intermission. No experience is necessary as training is provided. A minimum commitment of two shows is needed, plus attendance during two of the tech week rehearsals. Because makeup is completed before the cast goes onstage, you get to see most of the show and the results of your work! Give props to this crew, they make things happen! The Props Running Crew manages the props, setting the stage for each act and making sure cast members get what they need when they need it during the show. The crew consists of about eight members (adults, teens, and older kids, generally 12 years old and up); members must attend at least one of the weekend rehearsals in November, every tech rehearsal, and every show. We will make every effort to work around one or two conflicts, but would prefer you commit to the entire run. If possible, the crew may get the opportunity to watch one show from the audience, but you can watch every show from the wings! Please Note: Because of the small size of the crew, slots for new volunteers are few but please contact the Volunteer Manager if you are interested. Wigs and bobby pins and curling irons, oh my! The hair crew assists the chorus, and sometimes the principal actors, to prepare their hair styles based on instructions from the hair designer. A minimum commitment of two shows is needed, plus attendance during two of the tech week rehearsals. Because hair is completed before the cast goes onstage, you get to see most of the show and take in your handiwork under the stage lights! Hair Crew members may also overlap with Wardrobe Crew volunteers, if they so desire. No wardrobe malfunctions here. Our Wardrobe Crew assists chorus members and principals with their costumes during the show run as well as during tech week, the costume parade, and the dress rehearsal. During the run of the show, this crew assists the wardrobe mistress with costume preparation and making minor repairs such as sewing buttons, snaps or fixing hems, and checking that all chorus members’ costumes are complete before they go on stage. 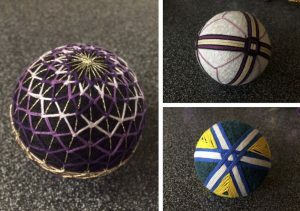 Basic sewing skills are helpful but not required. Crew members working at the theater are asked to volunteer for at least one tech week rehearsal night and two performances during the run of the show. Wardrobe Crew needs to be at the theater two hours before show time and can leave after all the chorus members are in costume. Wardrobe Crew members may also overlap with Hair Crew volunteers, if they so desire. A stitch in time saves nine. This important group does light sewing on costumes during the months of October and November. The sewing includes removing or adding trims, minor repairs, changing buttons or snaps and changing hems. Let us know if you are interested and we will notify you of all of the upcoming “sewing bees” taking place at the Revels office. Our Wednesday night volunteers come together while the chorus rehearses, working (and chatting and laughing) on projects ranging from preparing mailings to constructing props to creating small items to be sold at the shows. No special experience or talents are needed and no specific time commitment is necessary — come when you can and stay as long as you like! We are a very fun, casual, and friendly group (if we do say so ourselves!). It’s a great way to get to know other volunteers and cast members, all while listening to the beautiful music from rehearsals. Check back for the next workshop! ALL WORK PARTIES WILL BE HELD AT THE REVELS OFFICE AT 531 DALE DRIVE. Community members of all types come together to help with projects ranging from general office tasks, to carpentry, to prop organization, creation, and restoration, and beyond! Wednesday Night Work Parties for the 2018 Christmas Revels will begin in September! Check back in August for dates and times! For more information, email volunteer@revelsdc.org. 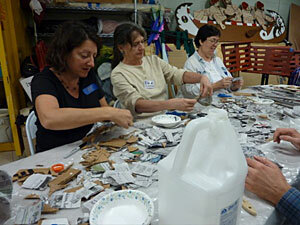 Come Revel with us in our Year-Round Workshops! Join fellow Revels volunteers for free monthly workshops where we will teach crafts and other skills related to our upcoming production of The Christmas Revels. Workshops begin in May and will occur on at least one Wednesday or Saturday of every month (May-Aug) until weekly Wednesday Night Work Parties begin in mid-September. All RYR workshops will be held at the Revels office and are available to participants of all ages unless otherwise noted. Summer Workshop Dates Coming Soon! Cross-Stitch: Whether you’re coming to refresh your cross-stitching skills, or simply to pick up kit components to work on from home, this is the workshop for you! Ribbon Sticks: An iconic part of many Revels performances across all cities, ribbon sticks a splash of color and sense of celebration to everything we do. Please RSVP by emailing volunteer@revelsdc.org.